Plymothian Transit: Blast from the past! © aecregent (Flickr blog this) October 1993 at Winkleigh. 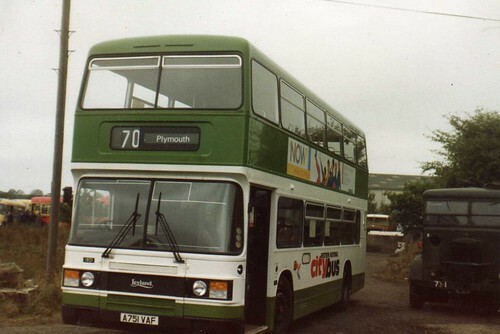 A751VAF when brand new carried this unusual version of NBC Green livery which was part of the joint services with Plymouth Citybus and carries large Western National Citybus logos. Another excellent photo Graham, whether old or new. This livery dates from the Plymouth Market Analysis Project exercise of 1983. As you know, it was a PCT led PJS project that resulted in the CityBus livery of red and more cream for PCT and leaf green and whiter for WNOC. WNOC buses were in service at the change without transfers, I recall. Pic of a VR in said livery here. "The art of citybusmanship" was the PCT strapline, BTW.